Welcome. I am so happy that you stopped by. My garden gate is always open for you to come in and sit and relax with a cup of tea while I share with you the inspirations for my art. The sky is blue, the birds are chirping and it is a glorious day to be in the garden in Southern California. Let's join Bentley, My Studio and Garden Assistant, in the garden to look for inspiration. As usual, Bentley, takes time out to stop and smell the flowers. The Stock are so fragrant he really likes to smell them. 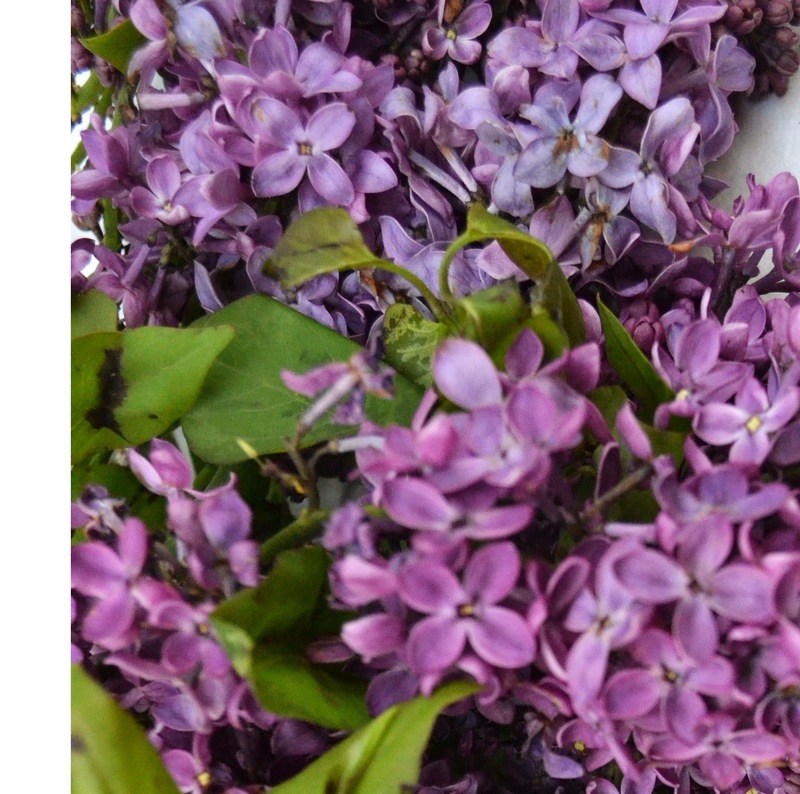 I love the smell of Lilacs and was thrilled to find large bunches of our California Lilacs at Trader Joe's. They come in white,lilac and lavender and the ones at Trader Joe's were more of a lilac color than lavender. 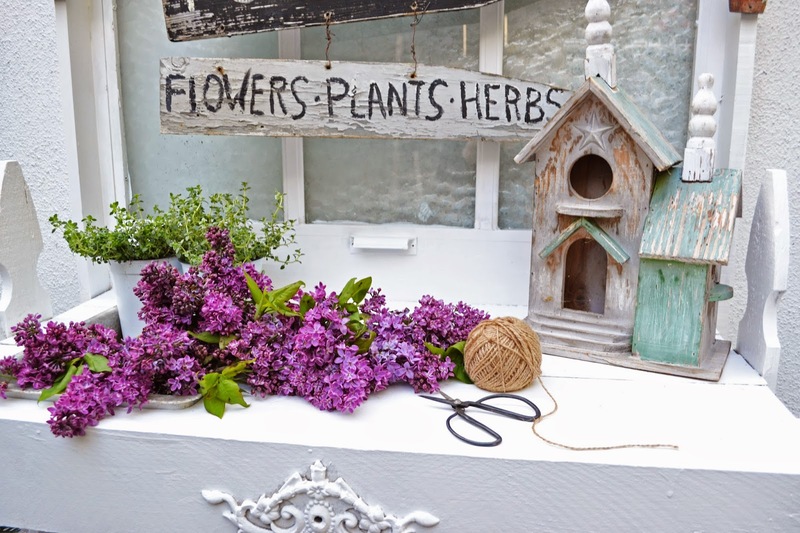 I love the way the Lilacs look in the white buckets and decided to paint them in the bucket and paint them lavender rather than lilac. 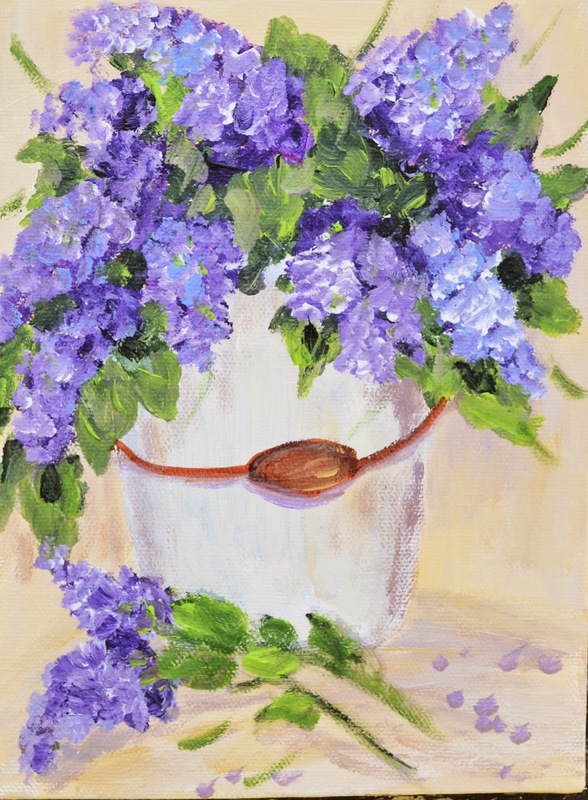 One of the fun things about painting is I can use flowers for inspiration and paint them any color I want to! 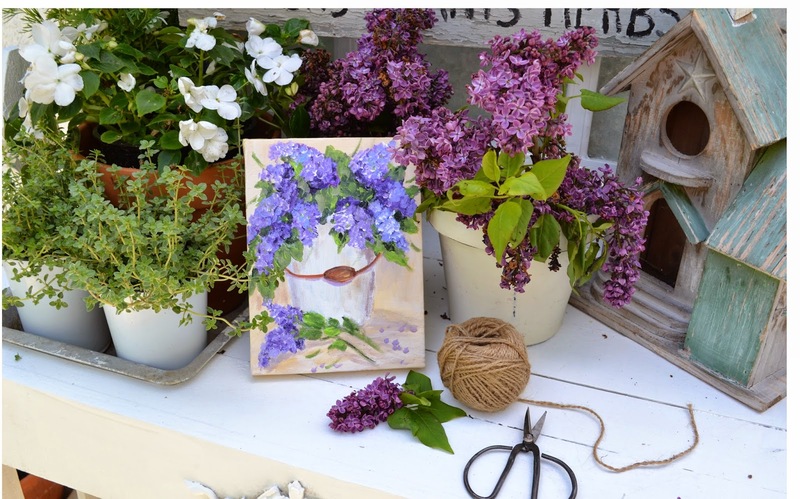 I painted my Lilacs lavender rather than lilac. Thank you for stopping by. I love hearing from you and sincerely appreciate your visits, e-mails, nice comments and those who follow my blog. Please let me know if you have any questions or would like to see me paint something special. A dog that smells flowers, all the ones I know can only smell food. 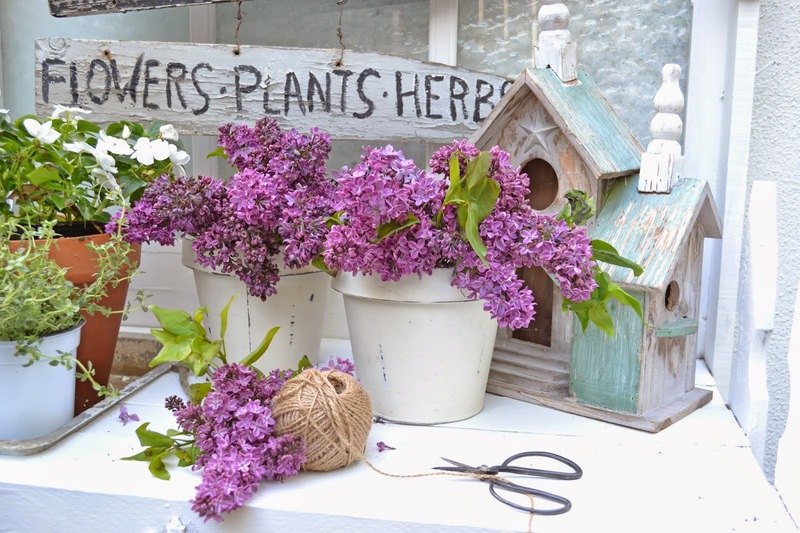 Your lilacs are beautiful and 'i love the smell of them. Your picture is beautiful - great job! I see that Bentley loves the garden also. 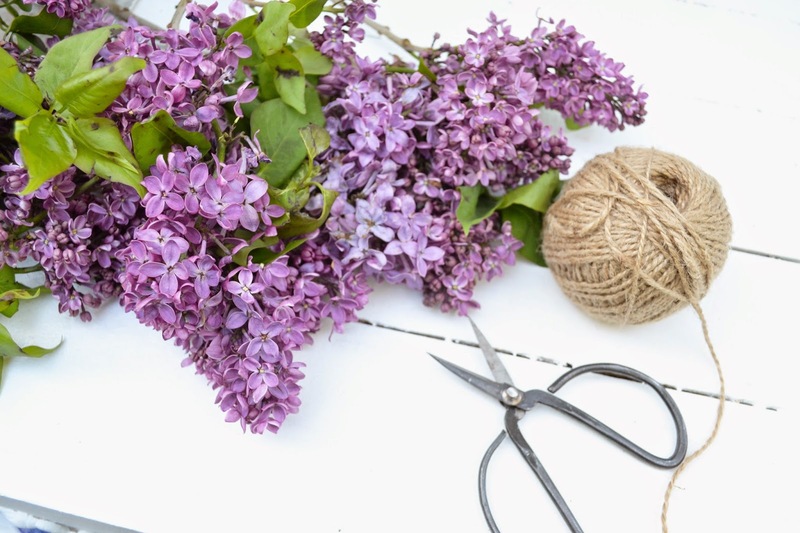 My neighbor has a lovely lilac tree which happens to be right outside my dining/family window -- and she has said "take what you want when you want; it's a short season." It'll be a few weeks before they bloom; We're just seeing the buds. But I am so very eager for their sweet fragrance. Lucky you -- with your wonderful talent you will have them all year long! Erin,I could actually smell them,so sweet. Lovely vignette and pretty little painting. Bentley is so cute. Your lilacs are lovely. I miss lilacs now that I am down in south Texas. Have a wonderful week ahead. I am wanting to "spice up" my garden and am looking back through your various posts for inspiration. I love your little paintings and I did one of a bicycle, inspired by you, of course. I want to try the lilac painting next. I love your style and I think I can do it! Thanks for the inspiration. I love the signs that you do also. And Bentley, too!